Nilfisk GD 930 Nilfisk This ever-popular canister vacuum is designed for solid performance in abusive environments. 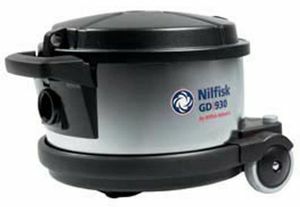 Its tremendous suction power and durable construction make it the best choice for demanding applications, such as mold or asbestos. A superior filtration system, including a HEPA filter, ensures a safer home or work environment. Dimensions: 17.5" x 15" x 13"